Earlier this month my wife and I rode Amtrak from New Jersey to Salt Lake City roundtrip. Two and a half days each direction allowed for much rest and relaxation in our sleeping accommodations. When we arrived in Salt Lake City we joined up with our woodcarving friend Lydia from Germany. Together we drove to southwest Utah to for a week of hiking and fun. 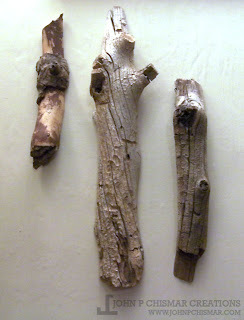 I returned from the trip with three small pieces of driftwood responsibly collected during our adventures. After the driftwood was treated to insure no hitchhikers were present I cut and planed the wood flat on one side to hang on a wall. These pretty pieces of Mother Nature’s art remind us of how beautiful Southern Utah is and the wonderful time we shared there.